Home > Product Management Resources > What is Product Management? > Skills and Strategies > What is Product Differentiation Strategy? Product differentiation strategy helps Product Managers answer these key questions “Why should a targeted customer buy my product?” and “How can I make my product stand out from the rest?” The seemingly easy answer is: because my product is different from the others on the market. Product Managers often shoot for the easiest way to create product differentiation: they add more features. They productize their way into differentiation. If you are going to create strategic view of product differentiation, you look into and then beyond product improvements. Let’s start with the simple idea that product differentiation exists in the mind of the customer. Put yourself in your customer’s shoes. Look out through their eyes and re-examine every way in which they solve their problem with your product offering. Here are a few strategic tools to help you focus on finding your product differentiation strategy. How do I find product differentiation? Productizing differentiation is a common task and uses tools and processes that Product Managers are familiar with. However these tools may miss categories of product differentiation that are easier, cheaper and longer-lasting. Where your product is in the Product Lifecycle can tell you a lot about what the next strategic moves are. The product, price and promotion portions of the marketing mix indicate what your best options are for product differentiation. For example, if you are in the growth phase, you should increase the number of different versions you have in a product line to more closely target different markets. You price the product to gain share and allow deal-making maneuvers. Your promotion efforts stress the differences between your product and your competition. Creating new and different versions of a product is very exciting for companies. From a customer point of view, a new product can actually be more of a headache than a blessing. Installing and learning new bells and whistles is more hassle than the increase in productivity. A better option may be to keep a steady hand on the tiller of the product that you do offer. Is it very stable? Is it the market standard? Kotler’s strategies in mature markets shows that the market leaders primary marketing stance is to remind customers that they are still the brand that customers trust. Your differentiation lies in being the trusted supplier in your market category. Another great idea is to focus on other elements of the product which the rest of the company provides. Customers buy from you not only based on product features. Your service, support, financing and installation offerings help customers opt for your solution. Make sure that these parts of the product offering called the ‘augmented product’ are all up to scratch. Now that you have the tools above, get out a piece of paper. Ok, you can make notes on a laptop if you must. Start writing. In Kotler’s model are you a market leader, challenger, follower, or nicher? In your last product (or next one up), what was your product’s delighter(s)? 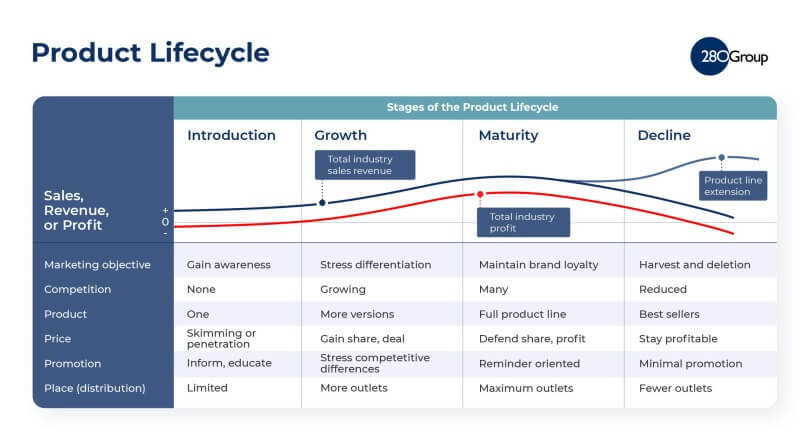 Which part of the product life cycle is your industry in? On that basis, what would be your best course of action? Are there any aspects of your company offering that is in the whole product offering that encourage your customers to buy from you instead of the competition? Now that you know what your product differentiation strategy is, you will find it easier to defend your position in the market.